Chasing the Dragon has that “middle book” feel to it that even the second and third Quantum Gravity books did not have. Each of the previous volumes had complete stories which also built upon the one before it. 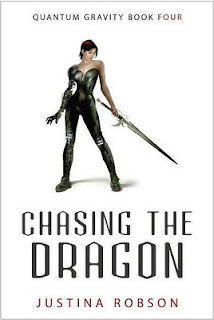 Chasing the Dragon has a story entirely dependant on Going Under, but it reads more as a middle book. It is set up, wondering, and wandering. There are a couple of things going on in Chasing the Dragon. First is that after the events of Going Under, Lila Black has returned to Otopia (Earth, our world) to find that 50 years have passed. She’s having a difficult time adapting to that fact, that the world she knew is long gone and so are most of the humans she once knew. Zal is fifty years dead, though she believes there will be a way to resurrect / restore him somehow. So much of Chasing the Dragon is Lila moping around and being cranky. There is also a bit of a side story (though it may well be central to the series plot) of Lila hearing a "Signal", something that seems at least partially sentient though incomprehensible. It is referenced, but seldom explored. The second thing going on is a bit more confusing because it’s about Zal. It happens early enough in the novel that I don’t think this should be considered a spoiler, but we find Zal in some weird alter-dimension. He’s either dead, mostly dead, or not dead at all. Justina Robson isn’t entirely clear, though I guessed “mostly dead” at the time. Zal doesn’t have his memories and there are other beings with him. It’s almost like he’s kept as a pet. I hate to say this because I very much like this series and hope for a satisfying conclusion with some future volume, but Chasing the Dragon was a bit of a disappointment. There are some interesting things going on here, a couple of major developments, but they don't add up to enough to recommend the book. Even though we don’t know what the larger picture is supposed to be, there is little sense of how Chasing the Dragon really connects to the previous books. By the end there are hints of different potential directions Robson can take the series, so we know that this is a set up novel. It’s just not a satisfying one.